Sweet Sharings : Cupcakes - Tips for Baking Perfect Cupcakes. Cupcakes - Tips for Baking Perfect Cupcakes. You can use any cake recipe to make cupcakes. Typically, cupcakes bake for 20 minutes at 350 degrees Fahrenheit. (180°C). However, not everyone's oven is the same and I would advise you to monitor your first batch closely. You can tell if cupcakes are done when they spring back when touched. Baking in a pan with a dark or non-stick surface : lower the recommended recipe temperature by 25°F to avoid overbrowning. Dark pans give your cakes a darker finish when baked at 350°F. Baking in Cups create a pretty fluted surface and allow you to bake without grease or pan spray. They also help keep cupcakes from drying out. Be sure to spread cups evenly in pan cavities and check that cups are level before filling. When using foil cups, remove paper liners, if included, before filling and baking; liners are included to help separate the thin foil cups. As a general rule, most cake recipes or mixes will work for cupcakes. Proper measuring of ingredients is the key to perfectly baked cupcakes. For dry ingredients, spoon into nesting measuring cups, overfilling the top first, then level it by running a spatula along the top. For wet ingredients, it would be best to use glass measuring cups. Pour to the exact level needed. Line cupcake pans with cupcake papers, or grease the pans. Even non-stick pans must be prepared before baking. Prepare pan cavities by spraying with non-stick vegetable oil pan spray or coat with vegetable shortening and flour for perfect release without sticking. Mix thoroughly but don't overmix. Over-mixing can cause your cupcakes to taste chewy and flat. After mixing the batter and just before filling the cups, gently fold in sprinkles, chopped nuts, chocolate chips, fruit, crushed hard candy etc. Fill the cups 1/2 to 2/3 of the way -- ( Too little causes cupcakes to burn or dry out, and too much will cause batter to spill, drip, or not cook thoroughly). After filling the cups let them rest for 2-5 minutes to let the batter settle evenly. Decorating bag - The best way to add the batter is to squeeze it into the cup using a decorating bag. Just fill the bag about halfway with batter, and squeeze perfect portions into your cups. Using a bag will give you better control, especially when making mini cupcakes. The bag keeps batter from spilling over the cavities. Ice cream scoop - a standard ice cream scoop in half-circle shape with lever handle. Spoon - use a heaping tablespoon. Fill cavity ½ to 2/3 full. Measuring cup - to give you a small and convenient container into which to put the batter. Set a timer so that you don't forget about your cupcakes. Place your cupcake pan in the very center of your oven. If your oven tends to cook items more that are towards the back, then rotate your cupcake pan halfway through the cooking time. If you absolutely have to bake 2 pans of cupcakes at one time, make sure you switch cupcake pans halfway through the cooking time. Bake cupcakes for the minimum time suggested, then test them to see if they're done. Cupcakes are done when you can insert a toothpick into the middle of one and it comes out clean and dry. Always wear oven mitts when removing cupcake pans from the oven. Place cupcake pan on cooling rack for at least 5 minutes. Remove cupcakes from the pan and place them back on the rack to cool further. Let the cupcakes cool completely before frosting them. Serve and enjoy cupcakes the same day they are made for optimum richness, moistness, and flavor. If you use a ready mix, freeze then defrost unfrosted cupcakes made before decorating; they hold up better and are more moist after a few days in the freezer. Before you begin icing and decorating cupcakes, make sure they are completely cooled. If you're icing cupcakes, first brush them lightly with your fingers to remove any loose crumbs. Place a dollop of icing in the center of the treat you want to ice. Using a table knife, make short strokes to spread the icing from the top of the dollop - this keeps crumbs from getting in the icing. If your icing is difficult to spread, dip the knife in hot water. Try using decorations other than candy, such as cereal, pretzels, chips, etc. For special birthday cupcakes, ice each one, then place a hard candy ring or gummy ring on top and stand a candle in the center of each one. If you will be adding sprinkles to your frosted cupcakes, add the sprinkles immediately, or the frosting will harden and the sprinkles will not stick to it. Cool cupcakes completely before covering to keep tops from becoming sticky (about 30 minutes). Cover cupcakes that will be frosted later loosely so the tops stay dry. If covered tightly, they become sticky and difficult to frost. Store cupcakes with a creamy-type frosting loosely covered with foil, plastic wrap or waxed paper or under a cake safe. Refrigerate cupcakes with whipped cream toppings or cream fillings. Frost cupcakes with fluffy frosting on the day they are to be served. Freeze cupcakes two to three months, tightly wrapped. Can keep overnight unrefrigerated. Do not frost them until ready to serve/display. If you store them in an airtight container, they will keep longer and stay very moist. Fridge- 1- 2 days at most. If storing in the fridge, you can decorate first. If more than 2 days, Cupcakes become hard as a rock because the moisture would be gone, not taste good and the liners will start separating from the cupcake - best would be in an airtight container. To prevent frosting on frosted cupcakes from sticking, freeze cupcakes uncovered 1 hour, then insert a toothpick in the top of the cupcake, and tightly wrap. Thaw cupcakes in the refrigerator or on the countertop. When thawing on the countertop, loosen or remove wrapping to prevent condensation. Decorating gel, hard candies and colored sugars do not freeze well because they tend to run during thawing. One trick I always use for moist chocolate cupcakes : mix some pudding mix in the batter; this creates heavenly moist cupcakes. Use paper cupcake liners to get moist cupcakes. This will help retain the moisture in your cupcakes because the liners hug and hold the cake together, reducing the drying effect. 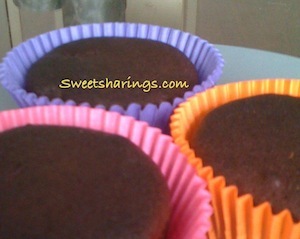 Skip the foil liners and the silicone cups if you want your cupcakes to stay moist. Including oil in your batter ensures your cupcake will be moist. However, because oil is all fat without any air or emulsifiers whipped into it, cupcakes tend to be dense. Using a combination of liquid fat and solid fat ensures your cupcakes be moist and airy. Replace 1/4 of the butter or shortening in your recipe with vegetable, canola or olive oil. Place your eggs in a bowl of 110-degree Fahrenheit water then cover the bowl with plastic wrap so your eggs are at an optimal temperature for beating. Beating warm eggs will produce well-risen, moist cupcakes. Combining the sugar, fats and eggs together aerates the fats, dispersing them well throughout your batter so your cupcakes are moist. When combining your dry mixture with your wet mixtures, set your electric beater to the lowest setting. Beat your batter just until it is partially combined. Finish incorporating the mixture with a rubber spatula so you do not overbeat the cupcake batter. This helps keep your cupcakes moist and soft as they bake and cool. Butter and shortening are solid fats that must NOT melt prior to adding them to your batter. When you press your thumb into a stick of butter it should offer some resistance so your thumb does not sink down easily. All fats coat the protein and starch molecules in your flour. As the solid fats melt while your cupcakes bake, they produce air and steam so your cupcakes are moist and tender. Replace 1/4 of the butter in your recipe with shortening. Emulsifiers keep mixtures of oil and water well blended so they do not separate. They also enhance the strength and the flexibility of the protein molecules in flour. This means that as your cupcakes cook, the batter can hold air very well so you end up with a nicely textured, moist cupcake. Egg yolks and mayonnaise contain emulsifiers and fat. Consider adding a ½ cup of mayonnaise to your cupcake batter if you are batter does not include oil. The mayonnaise adds fat and emulsifiers without thinning out your batter, producing a very moist cupcake.